Matt Kemp had been mired in a massively disturbing second half slump before he smashed that go-ahead three-run home run off of Archie Bradley on Saturday night that beat the Snakes at Dodger Stadium. Kemp has been ice cold since the all-star break and particularly in the month of August where he batted .214 with a .577 OPS. He’s batting .211 since the all-star break while posting a pretty putrid .617 OPS. Regardless of his second half struggles, manager Dave Roberts is sticking with him. Kudos to Dave because there’s more than one reason why he’s still starting in left field and batting cleanup. Kemp has had a great season. Even though he strikes out too much, but most of the Dodgers do anyways. Kemp has been super productive but his post all-star break tailspin is something that should not be a surprise. Kemp is 33-years old. He plays the outfield, a position where you are required to cover vast distances. He’s got to use his legs a lot and for Kemp someone who’s had a history of leg injuries that’s something that can affect his hitting. He’s undoubtedly lost some bat speed along the way as well. An extended cold spell was probably on the horizon no matter what. It’s a long season especially for older players in their 30’s. Again, Roberts is sticking with him and it’s important to understand why. One reason is that Roberts is the kind of manager who doesn’t like to give up on his players. You don’t want to keep playing a guy who is actively hurting the club but if Roberts were to just throw players away then he would likely lose the respect of the rest of the players in the clubhouse. That’s the reason why he kept playing Logan Forsythe despite Logan not hitting a lick. Sometimes it can hurt the club though, example Austin Barnes. Most of the time it’s a good thing for the morale of the guys behind closed doors. Roberts doesn’t like to give up on his players and it’s a very redeeming quality in the skipper. However there are still two other good reasons to stick with Kemp. First of all he can still hit the ball out of the park, as we all saw on Saturday night. He’s got power and even during a slump he has the capability to catch one and muscle a ball over the wall. The other reason is because Kemp has been one of the best hitters in the majors this season with runners in scoring position. Before Saturday night’s game Kemp was slashing .347/.393/.561 with 6 home runs and 50 runs driven in with runners in scoring position. That’s right he’s driven home 50 runs in just 117 plate appearances. 50 runs people! There you have it. Those two reasons are why Kemp is still getting the majority of the reps in left field. He has power and is one of the best clutch hitters in baseball let alone on the Dodgers. With the club’s obvious problems hitting with runners in scoring position, Kemp’s abilities are a breath of fresh air. Those reasons give him value. And that’s why Dave Roberts will continue to get him playing time. I have stuck with Matt all year. I did not expect him to hit .300 like he did early, but I did expect some power and some clutch hitting. He has done that, and his fielding has not been as bad as everyone thought it would be. All this from a guy who was not even supposed to be on the team by all reports. He was a salary dump waiting to happen. Then he had a great spring. Nobody was biting on the trade front, so Matt started the year in blue. And he was their best player. The most consistent hitter when they were missing major pieces, like Corey and Turner. If not for Matt and the total surprise that has been Max Muncy, the Dodgers would be nowhere near where they are now. Kudo’s to Matt who totally deserved the Heart and Hustle award he was given a couple of days ago. A far cry from the player who was dealt after the 2014 season. Agree on most of what Michael writes. Even though he’s been regressing in the 2nd half, he was a real revelation in the first and who can argue with the last couple of games? He has responded positively to Roberts, and I’ve heard nary a blip about him in the negative. Dummy is not sticking with Matt Kemp again today. He is sitting again. I do not understand this reasoning. He has won the last two games, one pinch hitting and one start and contributed 5 RBIs, in the last 2 games, yet he is sitting again. His numbers against RIghtys and Leftys are pretty much equal so why does this happen? He is an all star. Does he sit to play younger players? No,he shouldn’t because the standings are too close for that to happen and That is dumb. Does he hit because he is tired? No That is dumb as he is well rested. Does he hit because he is hurt? No so that is dumb. Actually there is no good reason except Dummy is an idiot. Matt Kemp makes 21.5 million a year and has contributed more than anyone on the team and yet he sits for rookies and Dummy’s whims. DUMMY needs to be fired immediately. Over reacting there Pack. First off, no way Roberts is fired this late in the season. If he is fired at all it will be after the season. There is a day they call black Monday. Day after the season ends. It is typically the day managers are given their walking papers. Kemp is probably sitting because the best RHP in the league is starting today and quite frankly, Matt has not hit deGrom very well. Nobody has. Keeping Matt for when and if the Dodgers get into the Mets pen, especially the way he is seeing the ball, is wise. Sorry, I side with Roberts on this move. One person I would not have started is Grandal. I think Doc is hoping Grandmal accidentally runs into one, because lately, he couldn’t hit my fastball….and it is about 40 MPH at this point. I do not feel I am overreacting to Kemp not playing, maybe Dummy getting fired today. Most managers play the best 8 they have, of which Matt Qualifies! Matt’s numbers bear this out. I feel to side with Dummy is not doing the Dodgers justice. 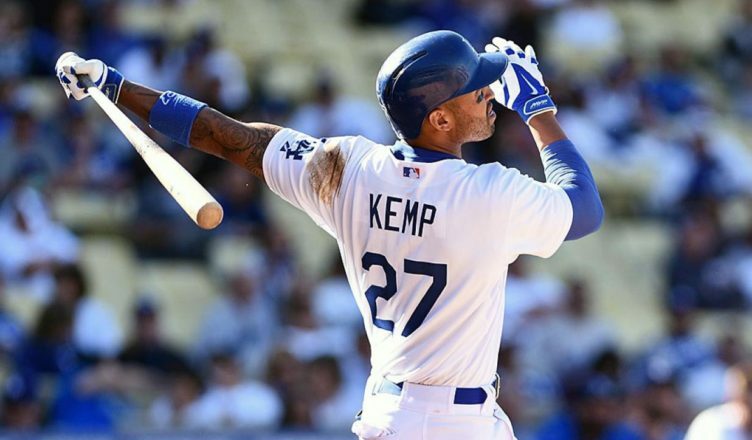 Yes, it will keep Kemp from maybe not hitting but does not give the Dodgers the best chance. To me, it all about winning. I guess you feel a outfield of Joc, Verdugo and Puig is better without Matt?? Did I say that Pack? What I said, and what is true is that deGrom is one of the best pitchers in the NL. Kemp is 4 for 16 against deGrom with no homers and 3 K’s Turner is worse, he has never had a hit off of deGrom. Puig may not have a high average off deGrom, but he has 2 homers off of the guy. Muncy and Taylor are the only other players with HR’s against him..Seager hits him the best, and Taylor is 3-4 against him….And I disagree a guy who is 4 16 is going to make a whole lot of difference or give the Dodgers a better chance to win against the ERA leader in the league. I like that Matt can come off the bench later in the game against a lesser pitcher. I think you are not getting my point and that is Kemp is a better hitter especially in the clutch than any outfielder playing tonight, plus he has delivered two nights in a row. Saying Roberts has made a good decision cannot be right under those circumstances. Muncy has had only 2 abs against DeGrom. Pederson is hitting .182 and Puig at .186 are not as good as Kemp. Just HRs are not the answer when you cannot do it in the clutch. As far as making a difference, looks to me like Kemp has done it two nights running and deserves to start. I think you know that Kemp should start over any of the outfielders tonight. No way a good baseball man such as yourself thinks that lesser players should play over a proven vet. I don’t know why even when a good point is made it is dismissed as being wrong. I guess I just need to join some others. I got your point perfectly, I just happen to disagree. Yeah, Matt is a better hitter than anyone in the outfield tonight. And the heroics of the last two games notwithstanding, he probably should be out there. But Roberts is trying to load up the lineup with as many lefty’s as possible, and Matt is no Puig on defense. I also think Grandal should be on the bench. He is not hitting, and his defense has been shaky lately. But unlike you, I am not thinking with my heart, because if I did, Kemp would be out there everyday, but unlike you, I do not think he is being disrespected and I also think at some point his bat will be in this game. Depending on when the Dodgers can get to the Met bullpen. I wonder what Michael and Package think about Kemp and Roberts…. Michael wins. His reasoning is sound and it played out exactly as he said it would during the game. The problem is not Kemp being held out. The problem is that players like Grandal cannot advance runners. Grandal is on his way south. I have to hail Verdugo with his enthusiasm and bat to back it up. 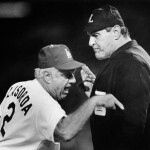 Loved the way he exhorted the dugout after he doubled. We need this kind of energy. The faster we replace Joc, Puig, Grandal, and Taylor as starters, and get players who can hit and get on base, that is when we will win games like this easily. Now, it is a struggle just to get some hits, and when we do, we look at them left standing there. The only real change that this team needs is to go in a different direction than the players I mentioned above. They have proved themselves ineffective over a full season. And, of course, we need a new manager.